From coast to coast, everyone has experienced some type of heat wave. With temperatures over 100 and heat indexes even higher, your body needs to stay hydrated in this harsh weather. But does your body need more? Should you add some electrolytes to your drink choices? But what about all those extra calories. Now there is a zero calorie, 100% Natural Spring Water that has naturally occurring electrolytes, Resource. 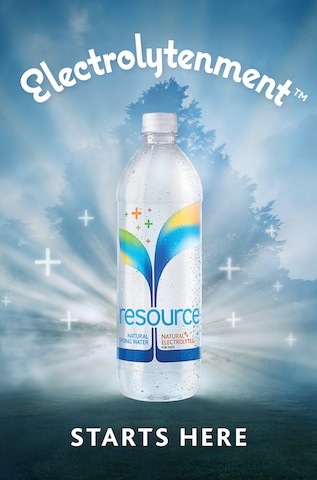 Resource is a new offering from Nestle America. This water celebrates mindful hydration by combining crisp, clean electrolyte water with a bottle made of 50% recycled plastic. The goal of this product is to achieve "Electrolytenment" for its consumers. What's "Electrolytenment"? It is the idea that consumers do not have to sacrifice to find a natural way to hydrate your body. This 100% Natural Spring Water can hydrate your body, nourish your mind and sustain your soul. This summer we have tried resource for my son during his swim meets. If your are around swimming, you understand that the 5 hours that you spend in the sun can be long and tiring. Of course the kids need lots to eat and drink in between heats, but I don't want to overload him with stuff (and high calories). No child needs the 6000 calorie/day diet like an Olympic swimmer. One of my biggest struggles has been finding a beverage that hydrates and replenishes without all the empty calories. For our last swim meet, we brought some bottles of resource for my son. He really enjoyed the water. There was no complaining that he wasn't drinking a heavily sweetened beverage. What I noticed is that he seemed refreshed after the meet. We didn't have a late morning sugar crash. He maintained a level of energy throughout the morning. Overall it was a great day for the family (and he won all his heats too!). Now that our nation is under a huge heat wave, everyone is feeling a little lethargic. We know that we need water and electrolyte supplementation with how much we sweat when outside during the day. I would recommend resource to my friends. Personally, I like the idea of all the benefits without the calories. Plus, the water has an easy to drink taste (very important when you need to drink so much to stay hydrated). Also, the recycled bottle makes me feel better about my product consumption. 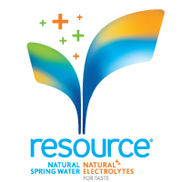 Resource is part of the Nestle Waters North America family of bottled water companies.For more information on resource and electrolytenment, please visit the resource Facebook page. Next time you're thinking about your water and drink choices, think about resource. You just might find Electrolytenment in a bottle. Disclosure: I received this product to try. I was not compensated for this post.